April 25 – May 30: African Voices and Savae, Inc. will present A Choice of Weapons: The New Renaissance Artists in celebration of the 100th Anniversary of Gordon Parks. Details to come. Wed., April 11 – Tues., April 17: The Film Society of Lincoln Center (FSLC) and the African Film Festival, Inc. (AFF) have again joined forces to present the 19th New York African Film Festival (NYAFF). Presented under the theme “21st Century: The Homecoming,” this year’s festival will explore the modern notion of home and homeland from the legacy of music legend Miriam Makeba—subject of the Opening Night Film Mama Africa—to Diasporic visions like the New York-set Restless City. The NYAFF will also mark the 100th Anniversary of the African National Congress (ANC) and the 50th Anniversary of Independence for Algeria, Burundi, Jamaica, Rwanda and Uganda, as well as give a unique look into the life of President Obama through a film on his half-sister, The Education of Auma Obama. The NYAFF will run from April 11 through 17 at the Film Society of Lincoln Center, and throughout April and May at The Jerome L. Greene Performance Space, Columbia University’s Institute of African Studies, Maysles Cinema Institute and the Brooklyn Academy of Music’s cinematek. “This is a continuation of the discussion about the shape of Africa that has taken place since independence and that is now not being embraced by the younger generation,” said African Film Festival, Inc. Executive Director and Founder Mahen Bonetti. “Though these young people have not in many ways been thrown a lifeline as post-Independent conflict emerged, they have somehow managed, through technology, to craft their own narrative, unconsciously drawing on the past and creating something new and very modern without having disavowed the past.” Tickets: $13 General Public, $9 Students & Seniors, $8 Film Society Members. Visit www.africanfilmny.org for info. Sat., April 14 – 11:00a New Federal Theatre’s BLOOM AGAIN: Ceremony followed by Concert at 12Noon: “Harlem for Japan: TOMO Friendship Ceremony and Concert”- Sakura Park, 122nd & Riverside Dr. in Manhattan. Thurs., April 19 – BROWNSVILLE to BROADWAY, afternoon of blues, tap, jazz, featuring The Harlem Blues and Jazz Band and Brownsville tap dancer Calvin Booker. Van Dyke Community Center, 392 Blake Ave., Bklyn., btw. Powell and Mother Gaston Blvd. Program is scheduled for 2pm- 3:15pm. FREE to the public. 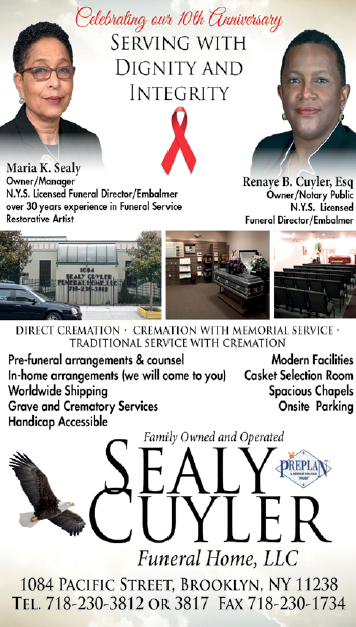 For directions, contact Van Dyke, 718-495-3719 or Councilwoman Diane Mealy’s office: 718-953-3097. Fri., April 20 –The legendary LOU DONALDSON QUARTET at JAZZ966. 966 Fulton St. at Grand Ave., 8-10pm.Donation: $20. 917-593-0776. Saturday, April 21- JAZZ SAXOPHONIST RUDRESH MAHANTHAPPA leads his quintet for the New York Premiere of SAMDHI SUITE at Carnegie Hall. Musicians are: guitarist David Gilmore, bassist Rich Brown, drummer Gene Lake and percussionist Anand Ananthakrishnan. The concert is presented by Carnegie Hall in partnership with The Joyce and George Wein Foundation in memory of Joyce Wein. Tickets: Carnegie Hall Box Office, 154 West 57 St.; CarnegieCharge, 212-247-7800; or visit: carnegiehall.org. Opening today and ongoing through April 6 – Tyler Perry’s new comedy, The Haves and the Have-Nots, starring Palmer E. Williams, Patrice Lovely, Tony Hightower, Alexis Jones, touches on today’s key issues: from foreclosures to finances, and the prayers, relationships, critical thinking, mother wit and humor that keep people afloat. It can be seen at the Beacon Theatre, 2124 Broadway, NYC. Tickets are on sale at Ticketmaster. Ongoing through April 15 – Journalist/Playwright Betty Dopson’s SHARED SECRETS of ELDER SISTERS, a play about the gripping confessions of seven sisters born in the early 1900’s who fought battles against racism, disrespect, sexism and poverty and won because of the choices they made. Stars: Dr. Adelaide Sanford, Nana Camille Yarbrough, Nana Betty Dopson. Runs on weekends: Fridays and Saturday eves, 8:00pm and Sunday matinees, 4:00pm. Black Spectrum Theater, 177th St. & Baisley Blvd. (Inside Roy Wilkins Park), Jamaica, NY. Tickets, Info: 718-723-1800. Site for the Above: 456D Jefferson Avenue, nr. Nostrand, Bklyn. Listings Submissions Sponsor: Magnolia Tree Earth Center of Bedford-Stuyvesant, Inc. Sat., April 14th: 11:00a-3:00p -PACC and Magnolia Tree Earth Center Tree Giveaway. 100 Free Trees will be given away to the public. PACC’s Affordable Housing Building- Magnolia Plaza, 686 Lafayette Avenue (btw. Marcy & Tompkins), Reserve your Crape Myrtle, Magnolia or a Pear Tree in advance! Go to www.nyrp.org/brooklyntrees. Trees will be available to individuals, families and community groups for planting on private property only and will be distributed on a first-come, first-served basis until supplies run out. Simple tree-planting and care instructions come with your free tree. All you need is a place to plant your tree and access to water. It is recommended that you bring a folding shopping cart to transport your tree. This event is hosted by PACC and Magnolia Tree Earth Center and is sponsored by: Toyota, plaNYC, NYC Parks Department, NYRP and the Million Trees Project. Rain or Shine. * First-come, first-served . * Arrive early as trees will run out quickly!